Last year one of my coworkers (Taylor) brought this dessert to a lunch. It was a hit, and the better news is-she was willing to share the recipe. 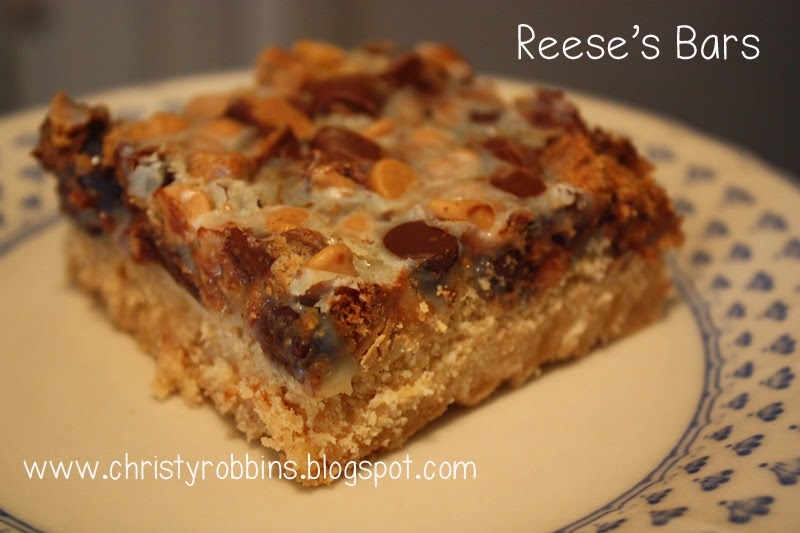 It's a really sweet bar, easy to throw together, and includes peanut butter-which pretty much covers my requirements for a dessert. I served them at a family dinner-and if there is a pickier panel that my extended family-I've never met them. So....if you like dessert, or have a hard-to-please family-try this out. 2. Mix cake mix, peanut butter, oil, and egg. 3. Press cake mix into the bottom of a 9x13 greased pan. 4. Top crust with peanut butter chips, chocolate chips, and mini peanut butter cups. 5. Pour sweetened condensed milk over everything. 6. Bake for 25-30 minutes. 7. Allow to cool completely before cutting into bars.